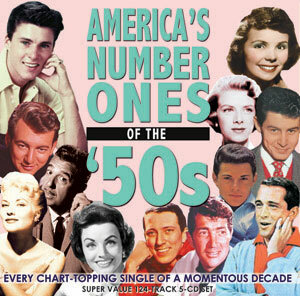 This exclusive 5-CD collection brings together every Number One in the US record charts of the 1950s as published in Billboard. It uses the “Best Sellers in Stores” chart as well as the Top 100 and Hot 100 when they were launched. The 124 tracks chart the course of a momentous decade in popular music with the familiar domain of the traditional artists of dance bands, variety, radio and the movies being overtaken by the rock ‘n’ roll phenomenon, as mass media gave the baby boom generation a voice while the world emerged from post-war austerity. It’s an extraordinary, fascinating and hugely entertaining kaleidoscope of popular music. For British and European audiences, it highlights both the influence the US charts had over what happened in the UK and also some of the differences between the markets, offering not only insight into the eclectic melting-pot of musical genres in the USA, but also some collectable tracks that never saw the light of day in Britain. Needless to say, it features some of the biggest names and landmark recordings of the post-war era, and will be a fantastic souvenir to remind those of a certain age of their wider musical roots.